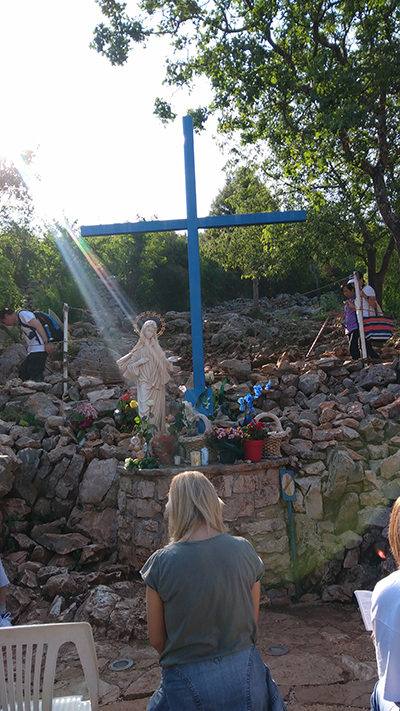 You can feel momma Mary ‘s mantle surrounding you once you set foot in Medjugorje. The peace and joy you feel cannot be put in words.Participating in the evening programs of rosaries , mass and adorations is so meaningful and joyous and everyone is so engrossed you can feel the harmony and the blessings we are all getting from Our Lord through Mother Mary.Father Peter Leung daily mass and sermons are a great inspiration to us.Marijana thoughtful arrangement and Lidija and Mario treatment of the pilgrims as friends rather then guests is a great help too.I hope to continue this feeling by bringing Mother Mary’s blessings to as many as possible through prayers and sharing my experience with others. 以往睇完風水 , 安放所謂的「法寶」; 知錯後, 拆下「法寶」，辦過告解，以為了事。 現在才知天主一直容忍自己收藏「法寶」, 沒有把其棄掉棄絕…. Such a blessed fruitful trip. I did not see Mother Mary physical in Medjugorje. I did not experience what you said about “Dancing Sun. I did not see any miracle at all. Simply saying, I need not bring along my brain with me in this trip. Once I was loaded at Sarajevo airport. It seemed that my mind was out of the time frame. My mind seem to be blank and all empty. I only followed what the tour guide and co-ordinators told me to do by following all the events. Let God’s will be done on me. It is a strong booster for a lukewarm Catholic, like me. If you are going to visit Medjugorje, please do not expect any sign; the greatest sign from God is HE has given HIS BELOVED SON to us, whom is dying on the Cross, redeeming us. Thus, if we do not believe on this, there is no point to search other sign coming up in our life. If God let you see a sign, you can see HIS sign anywhere, no need to fly that far. “If you knew how much I love you, you would cry to joy”. I always ponder this in my heart. Why is she saying this? I once asked myself too, she really loves us? Show me? Show me how? From this sentence, Mother Mary is assuming that we (human) did not know how much she has been loving us. True, we do not know, we do not realize, we do not care the goodness she has done for us, we take it for granted, we take it as it should be that way naturally. We focus on sadness, worries, burdens, broken hearts, hatred, anger, jealousy and money more, the time we spend on counting those is more than counting on the blessings we receive. It shows our greediness. If we keep thanking and praying, it means we keep Jesus in our hearts, we cannot go far wrong. Go to Medjugorje and get your own booster. I simply treated this trip as a retreat and have a chance to soak myself into the mercy of God. At last, I need to thank Pat, Kelvin, Glenda, Irene, Marijana (the tour guide), and Fr. Peter. Without them, my dream would never come true.